Concept: These are nutrient poor forest ecosystems often associated with fire disturbance. They are generally dominated by black spruce and pines with an understory of plants tolerant of acidic (nutrient poor) soils. Soils and sites are often very to excessively stony, especially when associated with granitic glacial till deposits. 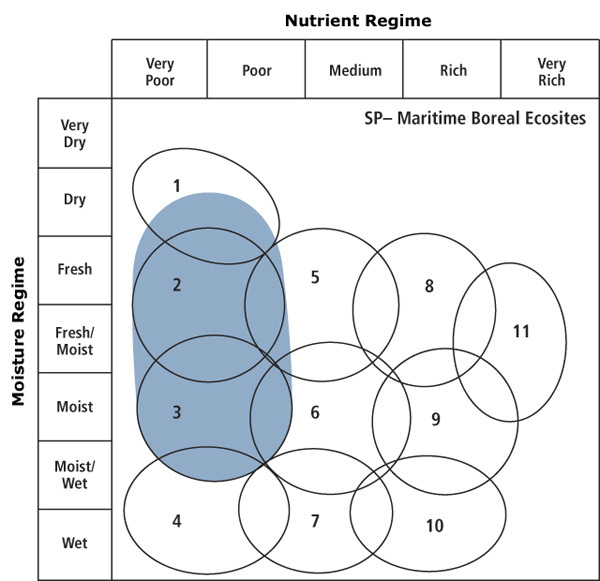 Soil moisture deficits are also common on many sites. All Vegetation Types (VT) in this group are found in the Acadian Ecosite group, with several also found in the Maritime Boreal Ecosite group. Vegetation: Crown closure can vary within and between VTs of this group. Black spruce and pines (white, red, jack) are the main overstory species. Red oak is also commonly associated with white pine in western Nova Scotia. The shrub layer is usually dominated by ericaceous species such as lambkill, blueberry and huckleberry along with black spruce regeneration (often through layering). Herb cover is dependent on the amount of light reaching the ground, but bracken and teaberry are almost always present. Bryophyte/lichen coverage is usually moderate to extensive and includes Schreber's moss and broom moss. Reindeer lichens can be abundant on drier sites. Environmental Setting: Vegetation types in this group are found on a range of slope positions, and are often associated with shallow soils on bedrock ridges and outcrops. Soils are mainly derived from coarse textured glacial till or glaciofluvial deposits. 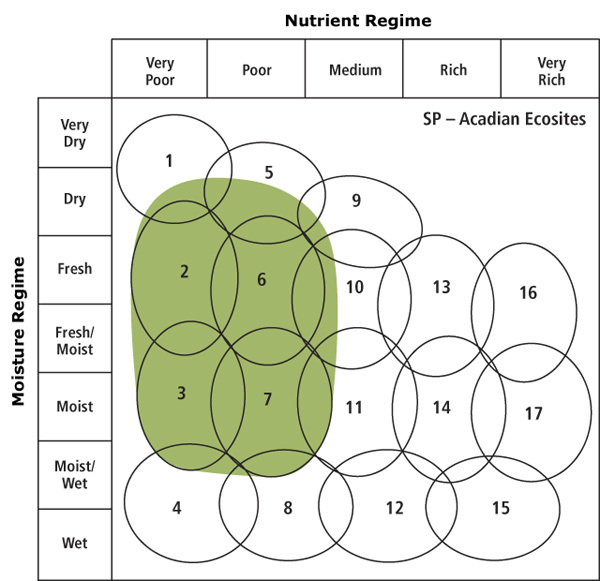 A wide range of moisture levels can be found, but fertility is generally low throughout. This group is found throughout the province, but is less prominent in the Nova Scotia Uplands (300), Cape Breton Highlands (200) and Cape Breton Taiga (100) ecoregions. Successional Dynamics: Spruce Pine VTs cover a range of successional stages, but all lead to an edaphic climax dominated by black spruce. Frequent natural disturbances include fire and windthrow. Stand-level disturbances are often intense leaving only scattered residuals, particularly fire-scarred pine. As the interval between stand-level disturbances increases, so does content of black spruce and/or white pine. If fire is restricted from the disturbance regime, the occurrence of red and jack pine ecosystems may decrease. Ecological Features: Forests in this group occur as small to large patches or matrix forests on sites that are nutrient poor and prone to seasonal drying. They are often associated with barrens, ericaceous vegetation, reindeer lichen and/or crowberry vegetation. Historically, wildfire was the predominant disturbance agent in these forests, at stand and landscape scales. Burn intensities varied greatly, ranging from severe crown to low intensity ground fires, each strongly shaping canopy and understory structure. Fires ensured these forests were maintained at early to mid successional stages, with open or closed canopies. Depending on burn intensity and fire return interval, post-fire stands may be simple and even aged, or more complex with uneven aged canopies, fire scarred trees, legacy patches and large deadwood. Ericaceous shrubs, especially lambkill, create thick duff layers with alleopathic properties (chemical interference with growth and germination) and an aggressive vegetative growth, limit black spruce regeneration on many sites. Productivity and species richness are generally low, but these forests can support several faunal and fungal species. Fire suppression is reducing the fundamental process supporting many VTs in this group.